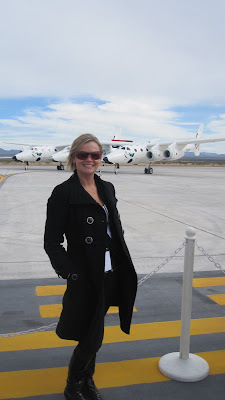 Last Friday I had the pleasure to attend the Spaceport America Runway Dedication. To begin with, this was an amazing trip for me as I had not been back in New Mexico since my days at the X PRIZE Cup and the Northrop Grumman Lunar Lander X Challenge. The truth is that all the hard work that took place during those years opened the doors to what today is the Spaceport America. It was absolutely amazing to finally stand on the grounds of the Spaceport, look around and realize how much has New Mexico accomplish since then. The building and the runway were truly stunning. I had the opportunity to attend this event with some of my colleagues, some of whom have also worked with New Mexico in the past and some who are truly pioneers in the commercial space industry. To say the least I could have not shared such a wonderful experience with a better group of people. The Friday event started with some welcome speeches by the signatories, Sir. Richard Branson, New Mexico Governor, Bill Richardson, and Virgin CEO, George Whitesides, among a few. The speeches and the press conference were followed buy a flyover of the mother ship “WhiteKnightTwo” and the "SpaceShipTwo" attached to it. Both vehicles did several passes in front of the crowd, but the best was seeing the flyby that started from behind the spaceport and over the crowd!!! WOW that gave us all the chills. After the flights we were surprised by an unexpected landing of both "SpaceShipTwo" and "WhiteKnightTwo." The event was a complete success and I will like to congratulate everyone who made the event possible. I look forward to the years to come when we will be able to fly in and out of the Spaceport America.